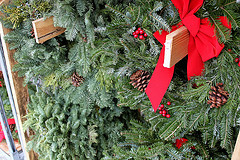 It’s not too late to join the Lefferts Manor Association for 2011 and receive your FREE holiday wreath. The deadline to join the LMA or to renew your membership in order to get a wreath is Tuesday, November 15, 2011. The wreaths will be delivered on Saturday, December 3, 2011. Volunteers are warmly welcomed to help tie on bows and deliver wreaths. LMA Board members will be organizing volunteers on their blocks. if you did not receive the flyer with a membership form and listing of our current members please contact us at LeffertsSupport@gmail.com.